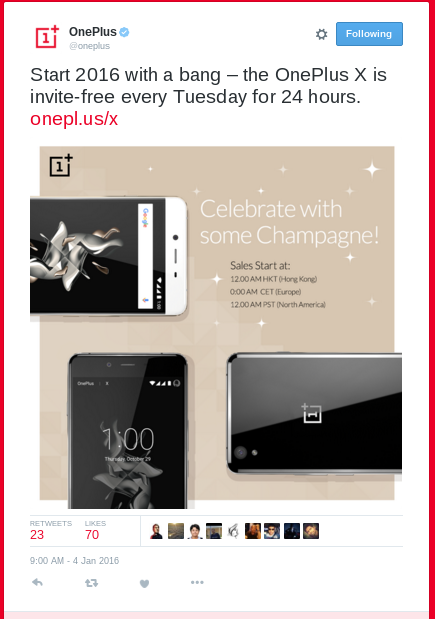 Chinese phone manufacturer OnePlus is known for selling their phones on an invite-only basis. OnePlus is kicking off 2016 by selling their OnePlus X invite-free every Tuesday. OnePlus loves to control the retail experience – every device they have released so far requires an invite to purchase. However, among the three devices they have released so far, the OnePlus X may be the easiest yet to obtain. OnePlus came to China back in 2013. Their first device, the OnePlus One, was internationally released in June 2014. With the OnePlus One, the only way to get an invite was through special promotions such as the controversial“Smash the Past” contest, or from invites that were given to people who already bought the device. The OnePlus One did eventually open up sales in 2015 to an invite-free every Tuesday model, and now, at the time of this writing, can be purchased invite-free for $250. The OnePlus Two (July 2015) had a better system. An actual forum potential customers could use to try to get an invite. The OnePlus X is handled the same way. This made the OnePlus Two considerably more available than the original, and they still had promotions where it could be bought invite-free for a limited time. As of December 2015, the OnePlus Two became invite-free forever. A mere three months after the OnePlus Two, the OnePlus X was first available in October of 2015. It’s release was handled in much the same way as the OnePlus Two, but became reasonably available to the general public in a much shorter time frame. The biggest question here is, with only a few months between them, how much better could it possibly be? The OnePlus X is largely the same as its predecessor. Major difference include a faster CPU, smaller screen, smaller battery and external storage. OnePlus decided to offer a different configuration instead of actually producing an all-around better device. However, this should be expected considering the devices were released nearly back to back. OnePlus better be careful, they don’t want to end up like SEGA and release too many devices too quickly with the result of losing consumer interest. Regardless, the OnePlus X stays true to the OnePlus ideal of releasing products that can stand toe to toe with other flagship devices on features, performance, and price.